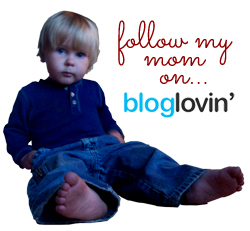 Do your kids love music? Do you want to use their love of music in a productive way? Then Happy Kids Songs might be right up your alley. 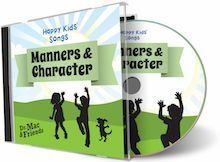 These delightful songs are all about teaching kids character, one song at a time. Each digital album sells for $4.95 through iTunes or Amazon and contains 5 songs. You can also buy the songs individually for 99 cents each. 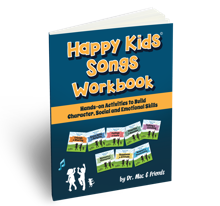 In addition to the songs themselves (which I received as a digital download), I was sent a physical copy of the book Happy Kids Songs Workbook: Hands-on Activities to Build Character, Social, and Emotional Skills ($12.56). With a product like songs, there are really a thousand different ways you can use it. Since we’ve gone car-free, listening to them in the car wasn’t really an option for us, although that would definitely be the most intuitive place. What I did instead was to put the mp3s on my phone (my current music player of choice), and we’d listen to them periodically throughout the day. When it was time to clean the house . . . Happy Kids Songs. When Seahawk and Munchkin were playing Legos . . . Happy Kids Songs. When we were preparing or eating dinner . . . Happy Kids Songs. You get the idea. And you know what? These songs are cute. They’re really fun, catchy tunes, and the good messages behind them can’t be beat. H-O-N-E-S-T-Y . . . Why? . . . Yeah, let’s repeat it. H-O-N-E-S-T-Y . . . Why? . . . We really need it! It’s one of those greatest gifts that money can’t buy. 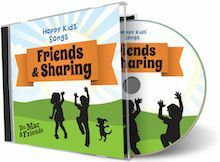 The image shows a CD, but Happy Kids Songs are only available as an mp3 download. Topics covered by the songs in the Friendship/Sharing album include “The Ingredients of Friendship,” making friends by reaching out to others, including others when you’re playing with a friend (essentially introducing two of your friends to each other so they can be friends too), being happy with your friends, and sharing and saying good-bye. In the Happiness/Attitude album, children learn to say “yes,” giving complements, handling their own limitations, being happy with yourself, and the benefits of both togetherness and being apart. Finally, the Manners/Character album covers things like honesty, manners, appreciating differences, being nice to others, and seeing how different people can view the same thing and come away with different ideas- and how that’s okay. While Happy Kids Songs are recommended for a wide age range – 3 through 8 – Small Fry (age 2) liked them the best out of all my kids. This wasn’t really unexpected for me, though. Seahawk is outside the age range at almost 11, and Munchkin is right on the outer edge at almost 8. Small Fry, though . . . He loved them! Whenever I turned the songs on, he’d get a huge grin on his face and start wiggling and dancing around. He doesn’t talk yet, but he would “sing along” the best he could. Because Small Fry was the one who listened to these songs the most, we didn’t do much with the book. 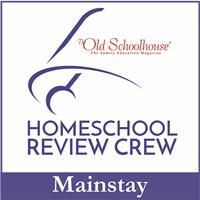 For school age kids in the middle of the age range, though, it would be a fabulous resource. It contains lyrics to all the songs as well as games and puzzles that go along with the songs. For a child in kindergarten or first grade, I think it would be a really good addition to the songs themselves. On the Happy Kids Songs website, you can listen to samples of each of the songs. There are a total of 8 albums, each with five songs. I’ve only talked about the three I have in today’s post, so I encourage you to explore further and find the album – or individual songs – that are just right for your family.